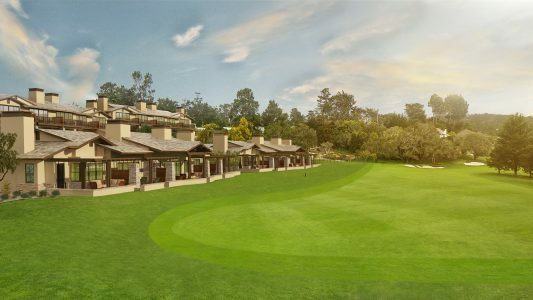 PEBBLE BEACH, CA — Pebble Beach Company has announced an August 2017 opening for Fairway One at Pebble Beach Resorts. A distinctive addition to The Lodge at Pebble Beach, Fairway One will add 38 guest rooms, including 30 guest rooms in three two-story buildings and eight rooms in two four-bedroom golf cottages fronting the first fairway of Pebble Beach Golf Links. The Fairway One complex will also include a new meeting facility anchored by a 2,500-square-foot meeting room. Fairway One is part of a series of exciting and impressive upgrade projects taking place at the acclaimed resort property, among them the phased renovation of all 454 guest rooms at The Lodge, The Inn at Spanish Bay and Casa Palmero, and subtle but important restorations to Pebble Beach Golf Links. All of these enhancements are being completed in preparation for hosting the 2018 U.S. Amateur and 2019 U.S. Open championships, as well as the celebration of the resort’s 100th anniversary in 2019. 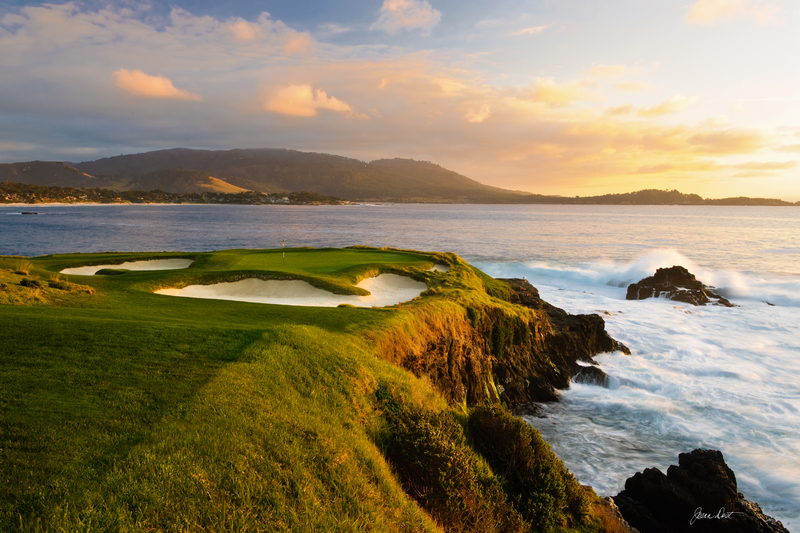 These investments will further solidify the reputation of Pebble Beach as North America’s premier coastal golf resort. Pebble Beach Company has entrusted renowned hospitality design firm Hirsch Bedner Associates (HBA) with the interior design of Fairway One, as well as The Lodge and The Inn guest room renovations. Located on the left side of the first fairway, the Fairway One complex will offer a new and enhanced guest room experience with oversized accommodations, a greater sense of privacy and unparalleled personalized service, all featuring spectacular ocean, garden and golf course views. It will offer 30 guest rooms in three two-story hotel buildings, two unique four-bedroom golf cottages, and the meeting facility. The two Fairway One Cottages, which front the first fairway, each will feature a 1,000-square-foot living room, two king bedrooms, two queen/queen bedrooms, and an outdoor terrace with fire pit. Each living room will be characterized by a 17-foot-high wood-beam ceiling, rich wood millwork, and an authentic wood-burning floor-to-ceiling stacked stone fireplace. They will also each feature two 55-inch HDTVs, a wet bar, a dining area and oversized furniture in groupings that encourage a communal experience. A uniformly white architectural palette will be accented with rich earth tones. The 30 Fairway One guest rooms will be located behind the cottages. Large picture windows and terraces create a panoramic connection with the golf course and nearby ocean. Open floor plans give the guest rooms a feeling of space and freedom, and starting at 660 square feet, will be significantly larger than a typical luxury hotel guest room. A soft neutral color scheme, classic patterns and details will evoke an elegant beachside cottage, and adding to the ambience will be architectural lighting in key areas by the HBA lighting design subdivision. Prominently situated on the arrival court of Fairway One, the Fairway One Meeting Facility will feature several meeting and event space options that can be booked individually or as a complete group buyout. The meeting facility will be ideal for everything from business events to weddings and social gatherings. Its centerpiece will be the 2,500-square-foot Fairway One Meeting Room with a capacity of 225, featuring floor-to-ceiling views of the first fairway and looking out towards the first green. Other spaces will include the 700-square-foot Fairway One Board Room (26 capacity), 1,000-square-foot Fairway One Living Room (80 capacity) and 2,250-square-foot Fairway One Terrace Patio (250 capacity). Local art, natural materials and hues, and tactile finishes throughout the facility will subtly reflect the character of Pebble Beach. In addition to the Fairway One complex, all existing guest accommodations in The Lodge, The Inn and Casa Palmero are being renovated inside and out, for a fresh take on the traditional look and feel that is Pebble Beach. At The Lodge, enhancements will maintain the hotel’s timeless elegance and include a 30-percent expansion of window walls in all ocean-front rooms to maximize views of Pebble Beach Golf Links, Carmel Bay and the Pacific Ocean. Ocean-front patios and decks are also being doubled in size to serve as an outdoor living space. Inside, bedroom renovations include new furnishings and accessories, substantial bathroom upgrades, a signature fireplace wall and the addition of air conditioning. Among the technology upgrades are 55-inch HDTVs, new lighting, energy management systems, and state-of-the-art door locks. Building exteriors, too, are receiving a fresh new look enhanced by wood, stone and stucco. Guest rooms at The Inn embody a more contemporary, coastal California look, and will feature greatly enhanced and reconfigured window walls that allow guests to take advantage of expansive ocean views and The Links at Spanish Bay. Guest rooms will feature a full bedroom renovation to include new furniture and accessories, a new built-in desk and minibar space, updated marble fireplace, air conditioning and state-of-the-art technology. Bathrooms will be updated with new fixtures and lighting. Casa Palmero guest rooms will receive an interior makeover and technology upgrades, preserving the distinct style of the boutique, 24-room Mediterranean-style property. For more information on Pebble Beach Resorts, please visit pebblebeach.com or call (888) 251-9790. About Pebble Beach Company — Pebble Beach Company, headquartered in Pebble Beach, Calif., owns and operates the world-famous Pebble Beach Resorts®, including The Lodge at Pebble Beach™, The Inn at Spanish Bay™ and Casa Palmero®. The company also operates four renowned golf courses: Pebble Beach Golf Links®, Spyglass Hill® Golf Course, The Links at Spanish Bay™ and Del Monte™ Golf Course. Its other famed properties include scenic 17-Mile Drive®, The Spa at Pebble Beach™, Pebble Beach Golf Academy™ and Pebble Beach® Equestrian Center. It annually hosts premier events such as the Pebble Beach Concours d’Elegance®, AT&T Pebble Beach Pro-Am, TaylorMade Pebble Beach Invitational presented by DELL EMC, Pebble Beachsm Food & Wine and the PURE Insurance Championship. Future site of the 2018 U.S Amateur Championship and 2019 U.S. Open Championship, Pebble Beach Golf Links® has hosted five U.S. Opens, four U.S. Amateurs, one PGA Championship and numerous other tournaments. For reservations or more information please call 800-654-9300 or visit pebblebeach.com.